Brevity is a challenge. 250, 500, 750, and 1,000. These are word-counts I go by when writing in a flash, with the help of writtenkitten.net. Hermione Flavia at CravenWild has written a lovely review for my collection, Scraped Knees. She hosts a blog ample with feedback on books, cosmetics, and more. Stop by at CravenWild on your next coffee break, and feel inspired! Poetry is a funny thing. It’s kind of forced on us in school, and becomes something we love or hate, something that bores us to tears or moves us deeply. It’s also something that, well, a lot of modern hipsters like to think they’re poets, right? Poems are a lot like man-buns, lumberbeards, Mac laptops in Starbucks and toting copies of Nietzsche that you’ve never read. But poetry can also be Wordsworth, Byron or Maya Angelou. Or Eminem for that matter. 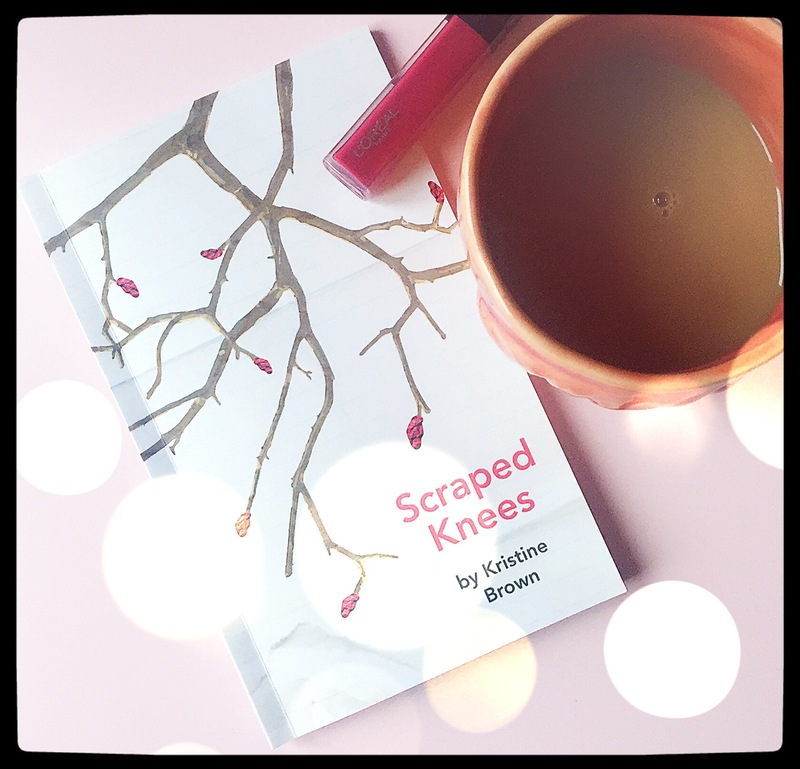 Kristine Brown, to get to the subject at hand, sent me an email asking me to review her little chapbook of poems, Scraped Knees, published by Ugly Sapling. I got the good vibes from her, so I said yes, though I don’t normally deal with poetry in this blog. I do happen to quite like poetry. I threw my shoes in a rusted trashcan. The one that accepted empty water bottles unconditionally, though the can for recycling stood less than a foot away. Two years old, with holes at the heels. Indeed, the passing of time suggested that like most women at crowded bus stops (the ones loudly pleading for their children to be quiet as they finished their back-to-school shopping), I would never pay my debts as a foot model. My hammertoe, bumpier still, would never traumatize those poor men waiting for hours at the urgent care clinic. Nor would my ingrown toenails command a second look as teenagers bitched in packs, walking home from the magnet school. I always insisted that flats didn’t hurt. But Lori, with her Sharpie, had points to make as she traced around my calluses. I just returned home, in front of the Travel Channel, which reminded me that if I cared enough, I could seize a promotion and finally, buy gray plaid shoes with memory foam so I wouldn’t ache so much. Lori just wanted to remind me of ways in which I was cruel. Mainly, to my bones, and the scarred fishtails on which I stood. Teenagers, again, walked before my indifference. Commercial after commercial, best friends smiling with those huge retro headphones blaring in some department store. I argued with Lori that it didn’t matter, that my toes were less than ordinary and life could be lived barefooted. She laughed, mentioning downtown potholes. Thank you, for not gushing about your backbreaking benevolence today. I didn’t particularly want to go, but went after watching caramel stick to the sides of a plastic cup. I usually end up tearing them apart. The cups, like I do with boxes of Kleenex when summer hits. No one talks, which I don’t mind. The silence is especially tolerable as this is one of a few locations where the Disney Channel doesn’t giggle all day from a battered JVC from 1995. A wall separates the staff from the seen and I’m able to feed words into the mouths of people I don’t know who walk four stories below. I didn’t have a story today. Neither did you. Nothing changed, aside from a session cut to a full ten minutes. Usually, there’s a girl who listens to nursery rhymes on a cassette player bandaged with Lisa Frank dolphins. I didn’t see her. The receptionist liked my sweater. I always wear sweaters. Unlikely to change, like August’s angry sidewalks. I passed a house for rent on my way back, wondering which hurts more. A nail through softened soles, or crossing the street barefoot? This I ponder from time to time as I’m fine with a few cheap shoes. The pulse remained in spite of the coffee. I told the nurse I stopped running. She asked me why, and I told her I found it boring. And, I’m lazy. I wrote the renter’s number on a card in my pocket. Haven’t called.